One participant from this years classic auto exhibit. This summer I had the opportunity to bring some vacationing relatives around Seattle and showing off the city. One stop for virtually every visitor is the Ballard Locks and if it happens to be summertime you're likely to get the most from the experience. The Carl English Botanical Gardens will have the majority of its plants in bloom, there will be weekend concerts, classic cars exhibits, and even an occasional play free to the public and of course the juvenile salmon make their transition from their fresh water habitat journey out to sea, while the "grownups" are returning to start the next generation or provide a tasty meal for any of several species who look forward to this time of year. Arguably, the greatest attraction is in fact the primary purpose of the facility, which is to assist boats to go from the inland waterways out to the Sound (and locations beyond) and vice versa. Being summertime there will be the usual assortment of working boats such as fishing vessels, barges, tugs and research vessels and a wide variety of pleasure boats as well. From canoes and kayaks on the humbler end, to yachts befitting the "Gotrocks" of the world, you're bound to see a non-stop parade of boats locking through. 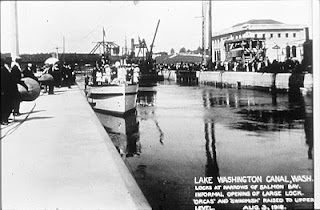 For those of us who have lived in Seattle a while and who have made many trips to the locks it is difficult to imagine the facility not being there and to bring guests for a visit does reawaken an appreciation for what it really is. There is however, at least one person who remembers quite vividly the days before the locks were built. Her name is Rosetta Cleary, born 1904, and she has been a Ballard resident since the early 1900's! Her father was a carpenter with the U.S. 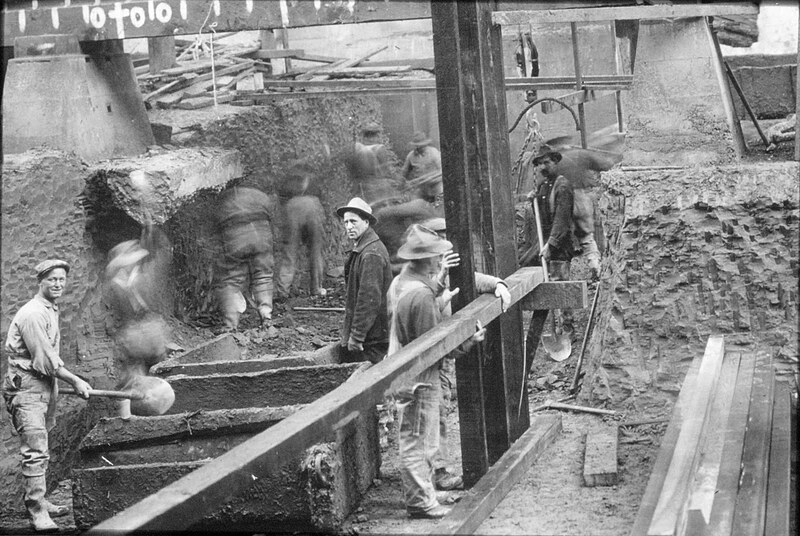 Corps of Engineers and was working at Fort Warden when he was offered a position here in Seattle to work as a carpenter in the construction of the locks which took place between 1911 and 1916. 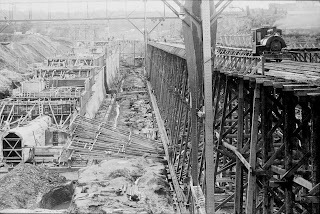 The lock in mid construction. Circa a long time ago. 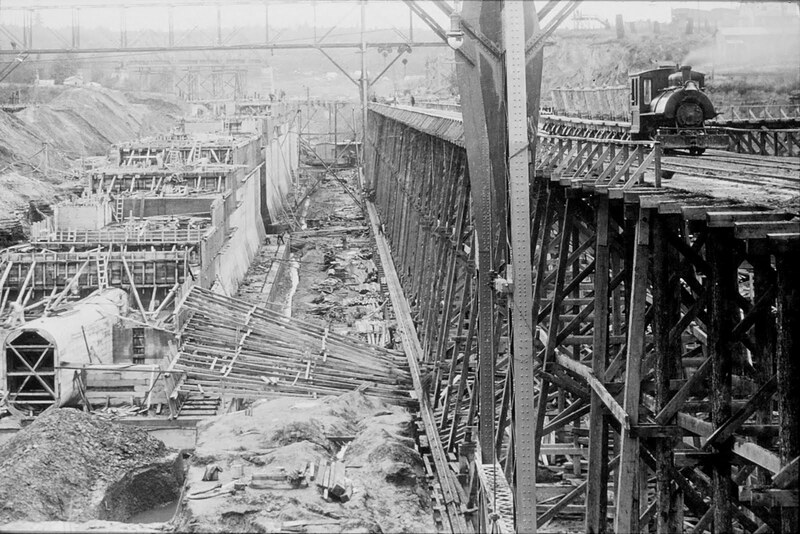 Tom: And, so he moved over here, do you remember when that was, it was before the locks, were they still working on them? Rosetta: "No they hadn't started them, that's how we came to Ballard. Papa was in charge down in Port Townsend. And then they transferred daddy up here to work on the locks. And he worked from the very beginning when it was just a hole but he was in the carpenters shop. He didn't have to push and carry and roll those big old wheelbarrows. 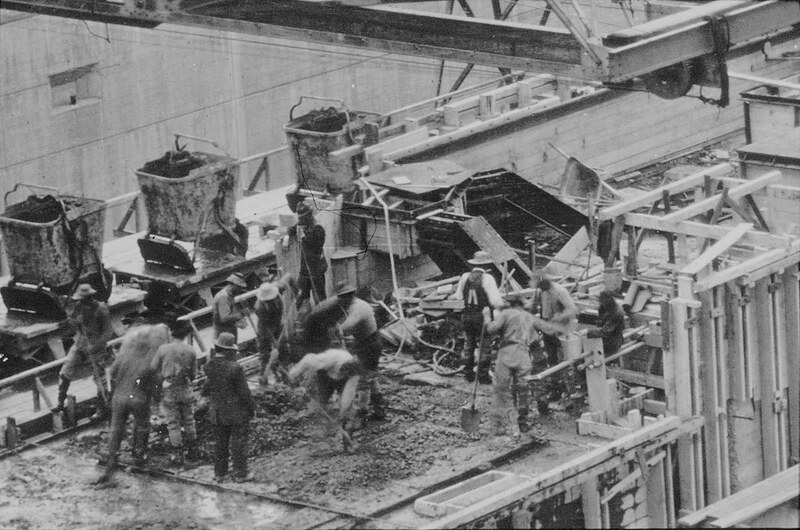 They were terribly heavy, because you know cement, when it mixed is very heavy and so they had to have very heavy things to carry it in so on top of the heavy lift that they had, they had to push these great big, heavy wheelbarrows. It was like a parade the way they had to work. They all worked in a row and there was a certain number of them I can't remember how many it was that was regular form they had for the wheelers. And when they wanted a drink of water they couldn't even go for it. They had to stand alongside of the wheelbarrow and they had water boys and when they wanted a drink the men held up their hands and stood by the wheelbarrow. They never left that wheelbarrow and got their drink. And then they would go on their way. But they could not leave the wheelbarrow". During the interview she referred to the arduous nature of the work she would see when would go down to the site to watch the progress of the construction. Her dad was in charge of the carpentry shop as she mentioned and two of her brothers also worked briefly as "water boys". Construction crew working with concrete. Rosetta: "There was quite a number of them working there and there was a lot wheeling the wheelbarrows because it took two to wheel those wheelbarrows. They were so very heavy." Notice all the hand tools in use. The safety hats seem to be either felt fedoras or tweed caps commonly seen in old movies worn by newsboys and which, at best, could only provide some small bit of protection from an errantly thrown newspaper! 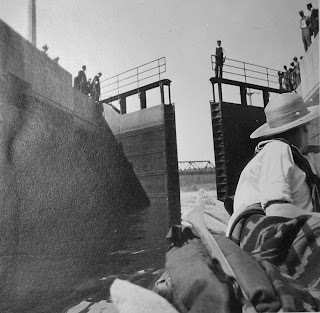 Later in the interview she discussed watching the boats from the walls alongside the locks. Rosetta: "And we had railings and only one handrailing across them and you weren't encased and you had to go across with one railing. Oh I didn't like that either. (laughing) I don't know why they were so expensive that they couldn't afford to put them up. There must have been a reason why. They would line up along the brink of the bridge and they never had a fence or anything there. You just stood right at the edge. Now they've got it all fenced off, you know. I used to be nervous when I would stand there to see the boats go through because there was nothing to protect you". View from canoe in small lock. Notice the single railing. Perhaps because of their familiarity with the locks and the frequency of their visits during its construction the family did not attend the opening ceremonies when the locks were officially dedicated on July 4, 1917. We will have to content ourselves with the descriptions preserved in the local papers of the day but it would be well worth anyone's time to read the accounts preserved on microfilm. All photos by permission of U.S. Army Corps of Engineers except the "View from canoe in small lock" which is courtesy of Pat Carlton.